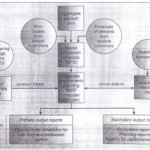 The aggregate production plan, as presented in Chapter 15, specifies product groups. It does not specify exact items. The next level down in the planning process after the development of the aggregate plan is the master production schedule. 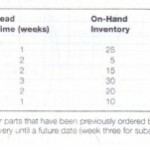 The master production schedule (MPS) is the time-phased plan specifying how many and when the firm plans to build each specific end item. For example. the aggregate plan for a furniture company may specify the total volume of mattresses it plans to produce over the next month or next quarter. The MPS then goes to the next step down in the process and identifies the specific models and sizes of the mattresses. All the mattresses sold by the company would be pecified by the MPS. The PS also states period by period (which is usually weekly) how many and when each of these mattress types is n eded.Still further down the disaggregation process i the MRP program. which calculates the requirements and schedules for all of the raw materials, parts. and supplies needed to make each of the different mattresses that are identified in the MPS.